Why: There is a lot to talk about surrounding this game, but we will try to get to the point with this one. 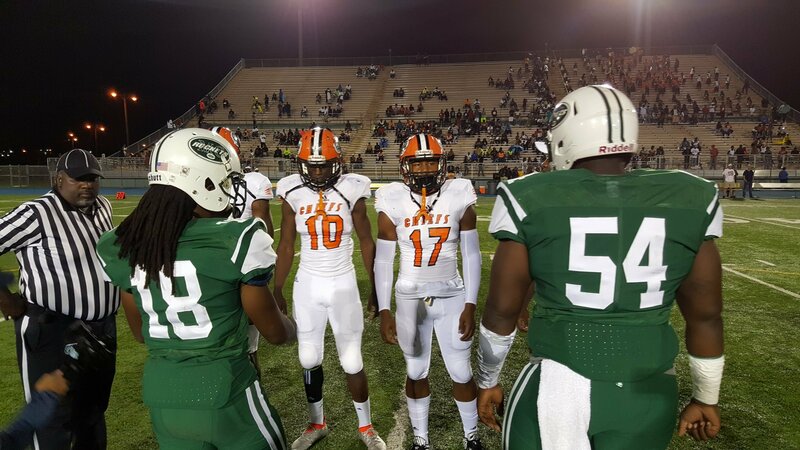 Miami Central is one of two teams looking to for five-straight state championships this season (Booker T. Washington is the other team), and this game puts everything to the test for the Rockets. Miami Northwestern has not won a game against Miami Central in a very long time, but with the wins, they have had this year has put them in playoff contention. Here is the deal, though – Miami Central loses this game their playoff hopes would be placed on thin ice as they would need some upsets to happen to force a tiebreaker situation and thus potential dashing any hopes of repeating or getting the five-peat. Why: This is a big district showdown between the top two teams in Class 5A which will also decide who will control the driver’s seat of the District 5A-16 playoff race. Both the visiting Chiefs and host Patriots are undefeated, but the only team will come away with the win. Expect the winner of this one to be a strong favorite to emerge from Class 5A South to represent at Drive To December in Orlando. Why: A big District 4A-5 tilt here which will likely decide who will win the district championship as early as next week. Jones comes into the game undefeated, but the schedule has not been as strong for them compared to Cocoa. Cocoa has faced some tough competition against national title contender Bishop Gorman as well as 2015 Class 7A runner-up Viera. Overall, this could be a four-quarter game for both teams. Why: Usually Class 1A games don’t get as much love or get pushed into the top five for Games of the Week, but there are exceptions to be made. This is one of them. Newberry which is coming into the game 6-0 will take on the defending Class 1A state champion, Trenton, at home. This game will be similar in atmosphere to the 2012 state semifinal playoff game between the two teams as they fight for the top spot in District 1A-7, which pave the path to the district championship to possibly be clinched fully as early as next week. Why: A huge District 7A-11 matchup here features a state semifinalist from last season in Braden River while taking on a Venice team seeking some revenge for the two losses they took against the Pirates. With this being a home game for the Indians and talent they have built on the roster shining so far, this could be a game that has Braden River looking to a game with Palmetto next week to keep their playoff hopes alive. Why: A last second matchup put together by both teams needing a game due to cancellations between Hurricane Matthew and a team pulling out of district play at the last second. Both teams are highly talented in their own rights, but will the visiting Cobras have enough to knock off the defending Class 3A state champions who have nearly a dozen players with Division I offers? Time will only tell. Why: This is a must-win District 7A-3 game for both the visiting Bobcats and the host Bears. Why a must-win game? It is because whoever wins this game is very much likely to win the district. The Bobcats struggled in their last game against Gainesville in which they lost in double overtime. Bartram Trail which has losses to Mainland and St. Augustine has played a stronger schedule to this point. But like we have seen from time and time again, this game could go either way. Why: Control for District 7A-7 is up for grabs in this matchup. Lakeland which has already seen one high-powered offense with Miami Carol City this season could be in for a big surprise with Winter Haven which has put up a ton of points in the five games they have been able to play. Overall, though expect a potential shootout between these two teams looking to leave it all on the field. Why: A big District 7A-6 matchup here which sees a much improved Martin County team compared to last season with a Viera team that has performed better than projected this season. The visiting Tigers have not lost a game since dropping their season opener to Okeechobee, while Viera has losses to tough opponents in Gonzaga (DC) and Cocoa. Whichever team wins this game will very likely win the district championship. Why: A key District 4A-7 matchup here with the host Sharks needing a big win over the visiting Raiders to keep their playoff hopes alive. While University School has won most of their games big, they let the most important one slip by them a couple of weeks ago, setting this matchup to be a big one. However, Glades Central has been tough to figure out at times, but when it comes to district games, the Raiders usually know how to step up their game. Look for this game to be an all-out battle to the end. Note: IMG Academy at Oxbridge Academy would have been considered for this list, but due to it being a Thursday night game, it was not considered.